The story starts innocently enough - Joshua and his friend are kicking a football around in their hometown of Amarias when the ball goes into an abandoned construction site. Chasing after it, Joshua discovers a demolished house and a tunnel hidden in the ground. He knows he shouldn't go in, the site itself is off-limits, but he's unable to resist exploring. Coming into this, I had no idea what The Wall was about or the subject matter it would cover, so please forgive me for thinking that Joshua would emerge from the tunnel into some sort of magical land. This is not what happens, you quickly learn that Joshua knows exactly where he is and where the tunnel will lead. 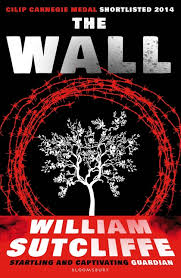 He knows that there is a giant wall separating Amarias from the people "on the other side." He also knows that traveling to the other side of the wall is forbidden, not only by his mother and stepfather, but by the authorities. However, all thoughts of the trouble he could get into are wiped from his mind after he emerges from the tunnel and is immediately chased by a group of local street toughs. With the help of an anonymous girl, Joshua is able to escape the boys and make his way back to the tunnel so he can go home. It isn't long before he decides to travel back so that he can repay the girl for her kindness. The more he gets to know the girl and her family, the more he comes to realize that his preconceived notions of good and evil aren't as cut and dry as he thought. Sutcliffe never comes out and says that Joshua is Israeli and that the people living on the other side of the wall are Palestinian, but it doesn't take long to put two and two together. The story itself is split between Joshua's desire to travel through the tunnel to help the girl and her family and thereby inadvertently putting them into danger, and his relationship with his mother and his overbearing, brooding stepfather, Liev. Liev, it turns out, is not a fan of the people on the other side of the wall. The tension Sutcliffe creates between him and Joshua drips from the pages and reaches a climax that will not disappoint. There has been criticism of this book, one reviewer described it as "Israeli propaganda for teens," while others question Sutcliffe's research methods while writing it. I am not going to even pretend to be an expert on the political and social intricacies between Israel and Palestine. What I can say is that Sutcliffe has written a novel that at its base level is about growing up, learning to think for yourself and coming to terms with having a shithead for a stepfather. In my opinion these are all things that a lot of people can connect with regardless of religion or politics. Labels: Everyone's Got Issues , Real Lives , War - What Is It Good For?